Not everyone can brag about having inside access to Foxconn factories, the place where gadgets like the iPad are made, but Rob Schmitz of Marketplace is one of those few people. 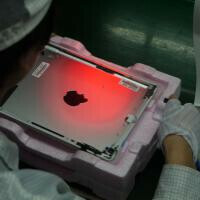 He teased us last week with a short video, and now the first part of his full report on working conditions at Foxconn describe some surprisingly not-so-terrible conditions at the factory, and even show how the iPad is assembled. When it comes to the manufacturing process, there’s a lot of work done manually, and robots only take care of certain tasks. For the rest, there is thousands and thousands of Chinese workers who choose Foxconn as it offers better salaries than other employers. The work seems very mundane, but apart from that Schmitz found some Foxconn workers laughing when hearing about the press the factory is getting stateside. It’s not really that bad, that’s what we’re left off after reading the report and the pictures seem to prove it. Foxconn factories are less like a factory and more like a city. In that particular one Schmitz visited there’s a huge soccer stadium, a basketball court, gym and Olympic-sized pool. In stark contrast, you can still see the safety nets, some 20 feet above your head reminding of the terrible suicide accidents that happened in the last couple of years. The nets have so far saved one life, but another suicide jumper after they were installed. And there’s no question we’re talking about assembly work at Foxconn - the shifts are long and the work repeats. Luckily, employees switch jobs every couple of weeks or so, and get a raise after the first couple of days of training pass. All in all, it allows the average staffer to send nearly $3,000 home. Not a bad income for otherwise poor China. Check out the video below and let us know - does this change your perception about Foxconn? Work harder,slaves,shallow iSh**p need their bragging rights as soon as possible!! !